Website optimization teams are more effective when UX Consultants and AB/Multivariate Testing experts work closely together. Why is the relationship so important? There are few who would dispute the importance of testing new website optimization ideas (hypotheses) in a live environment, with real users, using tools such as A/B testing software, before final implementation on your website. But the optimization ideas need to come from somewhere. And who is better qualified and has a better understanding of user behaviour than a User Experience or Usability consultant? Hundreds of hours spent watching and listening to users, sharing their pain and delight during website interaction, naturally results in a good understanding of what makes users tick. And as optimizing a website is all about influencing the behaviour of users in line with business objectives, their role in the orchestration of test experiments is really important. Whilst this is quite an extreme viewpoint, it’s clear that not all AB/MVT professionals are sold on the idea of usability. And in a similar way, many of the Usability consultants I have worked with over the years have been just as skeptical about AB/Multivariate Testing. So in an attempt to build some bridges between these two camps, we’re going to start by airing each others issues and concerns. One of the reasons why Usability and AB/MVT experts struggle to understand each other as well as they should is their use of language. They often talk about the same things in a completely different way. And this language barrier as well as their different viewpoints can again make it a little more difficult to get along. 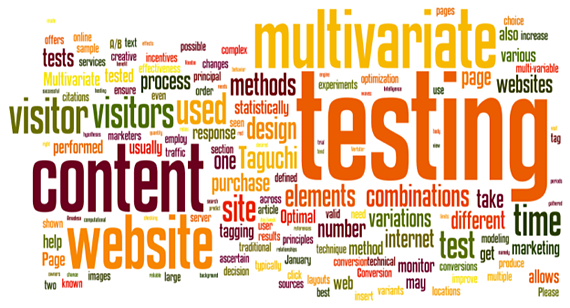 The following Wordle Word Clouds are snapshots of the Wikipedia page content for Usability and Multivariate Testing. Try finding the word “user” in the MVT word cloud or visitor in the Usability wordcloud! Also “Design” is so prominent in the “Usability” wordcloud, and yet so hard to see in the MVT wordcloud. 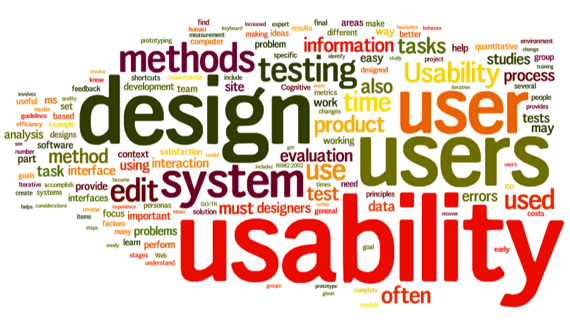 UX/Usability guys are wising up to the idea of AB/MVT as a very useful tool for evaluating and fine-tuning all the great recommendations which come out of usability testing sessions and other qualitative research such as surveys, remote usability testing etc. Websites such as whichtestwon.com have definitely helped raise the profile of AB and MVT in the user experience arena. And the fact that so many of the winning variants are due to enhancements to the user experience – just as often as they are due to persuasive design patterns and messaging – again reinforces everything the UX and usability consultants believe in, and makes them want to use the tool. The fact that tools are now so readily available increases their exposure to the wonders of MVT. Visual Website Optimizer (for testing existing site pages) and Unbounce (for building and testing new landing pages) are so accessible, there is no excuse not to have a go and learn all about them, even if you don’t know an “experiment” from a “hypotheses”! Check out the Econsultancy MVT buyers guide for more examples. Testing companies are now showing a greater interest in usability, or at least pretending to do usability. This suggests they are realizing its importance, or at least have realized it’s a good idea to talk about usability to prospective clients to allay their clients’ fears that the MVT house isn’t a user centric company. Usability and AB/MVT specialists can and should work together. The disciplines are totally complimentary when the individuals from either camp except the limitations of their own tools and learn to recognise the strengths of the others’. Finally working in silos is not the way forward. After all, we’re all working towards the same goal; to make your online business more successful. Please let me know your thoughts and feel free to disagree with anything I have said. Would love to hear from MVT companies who are usability testing fans? And usability people who like nothing better than split testing?